St. Petersburg Police continue to investigate a fatality crash that occurred shortly before noon on Sunday, January 27, 2019. Investigators say an Express Taxi (a 2009 Ford Crown Victoria), driven by 47 year-old David Yancey was southbound on 49th St. N with a passenger, 40 year-old Heather Scozzaro. 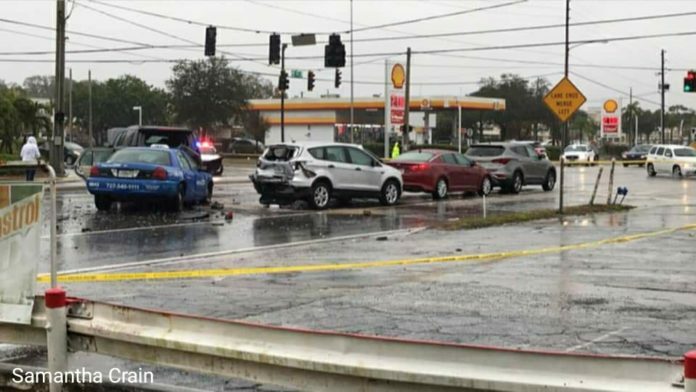 The taxi cab rear-ended a 2018 Chevrolet Tahoe driven by 78 year-old John McVey that was stopped at 38th Ave N.
This caused a chain reaction and ultimately four additional vehicles who were stopped at the red light were hit. The Tahoe hit a 2017 Ford Escape, driven by 71 year-old Barbara Weber, and a 2017 Chevrolet SS, driven by 57 year-old Thomas Stewart. The Ford Escape was pushed into a 2014 Kia Optima, driven by 85 year-old Warren Chase and the Kia Optima was pushed into a 2018 Hyundai Santa Fe, driven by 50 year-old Beth Johnson. Yancey and Scozzaro suffered serious injuries and were transported to Bayfront Health St Petersburg, where Scozzaro died. Yancey and Scozzaro were not wearing seatbelts. Police say alcohol played a role in this crash. The investigation into the crash is ongoing and charges are pending.